Whole class teaching is becoming embedded across schools using a teaching for mastery approach. This Work Group, consisting of teachers from local schools, will consider different models of intervention in a mastery context to ensure that mathematics teaching has maximum impact for all children. The participants will use case studies and research to inform their practice and build on the work of last year’s national project, contributing to an evidence base around which models work best. Schools will trial a model of their choice and will document their observations. 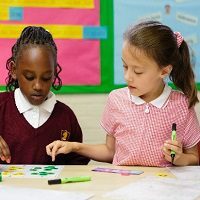 This Work Group is looking for teachers who lead maths and/or lead intervention in their schools. Schools should have begun to commit to teaching for mastery development, ideally having been part of a teaching for mastery Work Group previously. The school should have at least 2 classes or year groups where teaching for mastery is embedded. Teachers in the Work Group will choose an intervention model to trial within their school. Over the course of the year, the Work Group will collaborate to critique, develop and evaluate their chosen model(s) to feed into the national project’s conclusions regarding effective models for same-day intervention. Teachers will develop their knowledge, using case studies and research to choose an intervention model within a teaching for mastery context, which they will trial in school. Through contribution to the national evaluation, findings from teachers’ classroom-based research will form part of a national picture of best models for intervention. Schools will review the impact of their current practice and have the opportunity to explore other models to help fulfil the “expectation that the majority of pupils will move through the programmes of study at broadly the same pace” (National Curriculum for Mathematics, 2014). Swift and timely interventions will enable most pupils to ‘keep up’, reducing the need for ‘catch up’ interventions. In adopting teaching for mastery, schools have embedded whole class teaching as a method of delivery. Intervention, allowing pupils to keep-up, rather than catch-up, is a fundamental component of successful whole-class teaching in a teaching for mastery context. Schools have individually been developing different ways of providing this and a national project in 2017/18 has begun to collect evidence on models of intervention. In 2018/19, this opportunity is open to more schools, and the project welcomes new models for consideration. report back to the group and compare impacts with other schools. Interventions in the school may be observed by the Work Group Lead during the year, as part of their supporting work. Funding: This work group is funded through the DfE grant and can be offered at no charge to delegates.